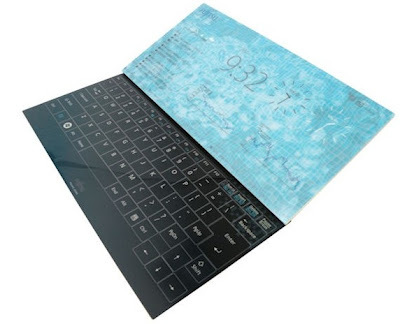 Mubi's Blog: Acer Frameless Laptop & Touchscreen Keyboard? Would you believe that Acer is working on a frameless laptop with touchscreen keyboard? As far-fetched as the idea might be, it's certainly plausible, expected even. The idea, as rumored by DigiTimes, involves doing away with the display's frame by printing colors directly onto the back of the display's reinforced glass substrate from Corning (a la Gorilla Glass presumably). Coupled with a touchscreen keyboard, the rumored device should be impossibly thin by traditional laptop comparisons. Keep in mind that we've already seen this Frame Zero concept pictured above from Fujitsu and Acer's arch-rival ASUS has been showing off its dual-display laptop prototype with touchscreen keyboard for months. Even the OLPC XO-3 plans to eschew the clickity keyboard in favor of a touchscreen version. And anyone who has ever seen a scifi movie knows that tactile keyboards and display bezels have no role to play in our computing future anyway, so we might as well get things started now -- or in the second half of 2010 according to DigiTimes' sources.